This sink is amazing. I love the detail on the front. It gives it a little something extra without being over the top. The matte finish has been very easy for me to clean, I have three little boys so it’s been put through the ringer already! 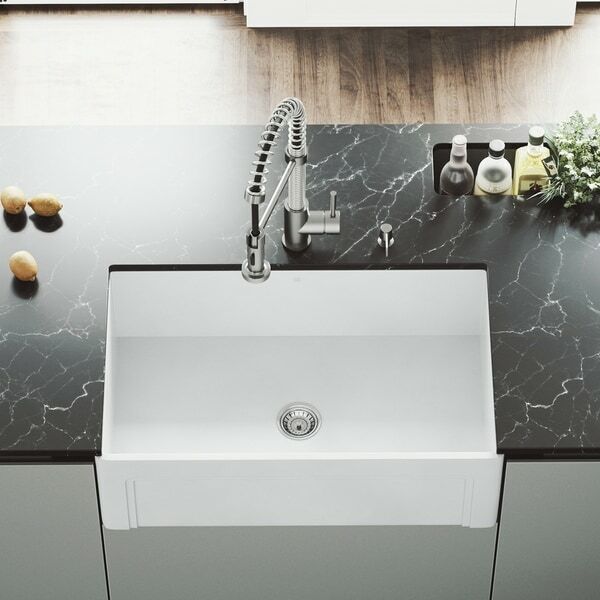 The 30 inches VIGO Matte Stone Farmhouse Kitchen Sink is constructed from VIGO's proprietary non-porous solid Matte Stone that resists stains, while the sink's 10mm radius curved corners are designed for functionality and easy cleaning. Choose your sink style: Install with either the flat apron or casement front on display for your modern kitchen upgrade. Includes a sink drain strainer and embossed VIGO cutting board. With this elegant designed farmhouse sink, it was a perfect addition to my new white kitchen. As my kitchen was being completely, someone left metal shavings inside the sink that turned into rust. After cleaning the sink all the rust was removed. It is a very durable sink. It's sleek design captures all my guest eyes. I have received many complements. Water drains easily as well. This sink is awesome! I love to detail on the front-makes it a little different than your regular white farm sink. It holds a ton of dishes and is very forgiving. It is a very sturdy sink. The template shown in the website pictures was very helpful during installation. I polled some friends before buying this sink and everyone loved the classic look yet clean lines. The matte finish seems like it may require a little care but for the look it seems worth it. Absolutely beautiful. Not installed yet but the sink itself is more then I expected. Love my new sink, it is perfect in my new updated kitchen. I love my sink! My contractor checked with his usual distributors and they all said they could get one for me, but not at that low a price. It was well packed and arrived in no time at all. I am extremely happy with my purchase and would definitely recommend it to anyone looking for a great buy! The sink we received is so beautiful and it was shipped so fast. On top of the great service we got an extra 15% off our next purchase. I will buy everything from overstock.com from now on. Love Love Love! Beautiful sink, nice size, love the detail. Just as stunning in person as in the pictures! This sink not only looks gorgeous but is spacious enough for my large family. "How heavy is this sink"
"is it undermount or topmount"
It is a flat apron or casement front install. "Is this a bright white or an off white color? It will be next to bright white cabinets and don't want it to look dinghy."